The Amaravati City Master Plan 2050 is all about the dreamy Amaravati, the first planned waterfront city in India. Nearly 10,000 visitors from across Andhra Pradesh have thronged the Amaravati pavilion in four days after it was kept open for public here. Prime Minister Narendra Modi was the first to visit the pavilion, where the Department of Museum and Archaeology has put on display details of the dynasties that have a connection with Buddhism in Andhra Pradesh. The pavilion, which has turned into a prime attraction, comprises four galleries — Amaravati; A reflection of glorious dynasties, Present Amaravati, Amaravati Sculptures in Museums and Amaravati city master plan 2050. “Most of the replicas of Buddhist motifs and have been brought from the State Museum at Amaravati in Guntur district. The visitors are turning the place into a selfie-zone”, said Museums and Archaeology Department official N. Durga Prasad. Mr. Prasad takes care of the motifs kept on display, restricting the enthusiastic visitors from touching them. The police are also registering the details of the visitors, keeping an eye on them. 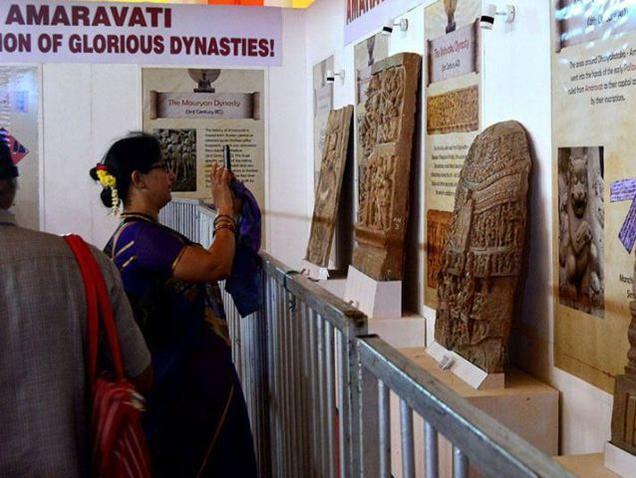 “A glimpse of the display at the pavilion takes us into the deep history of Andhra Pradesh and its bond with Buddhism”, said Raja Sekhar and his family belonging to Eluru in West Godavari district. The Amaravati Sculptures in Museum gallery throw light on the Buddhist sculptures which are being preserved at National Museum at Delhi and Chennai and Indian Museum at Kolkata. The Amaravati City Master Plan 2050 is all about the dreamy Amaravati, the first planned water front city in India. The pavilion would be open for public till November 7 between 9 a.m. and 5 p.m.